Ellis307 - Mi Excellent "I have used sunstar for years. 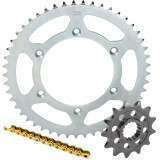 As long as you lube chain and keep proper chain tension this product last a long time at a fair price." lesman3 - vancouver Washington Awesome gear and chain! 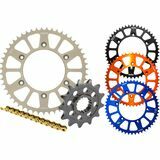 "works just as it said it would, changed the gearing for my wife's xt250 to run out further and more run time between shifts. works great just what she wanted."